Livewire recently got in touch with us to tell the story of 2018 in one chart, and how it is instructive going into 2019. Our choice, the 3 Month US Treasury Bill Yield. Even if you have no exposure to fixed income, interest rates still matter … a lot. Risk free rates form the foundation from which all discount rates are calculated. These discount rates are then used to value cash flows generated by assets ranging from bonds to stocks to real estate. As discount rates fell, the valuation of cash flows rose and therefore asset prices were pushed higher. Secondly, as the rate of return investors could get from lower risk assets fell in line with risk free rates, a great rotation of capital began that has lasted for the past ten years. 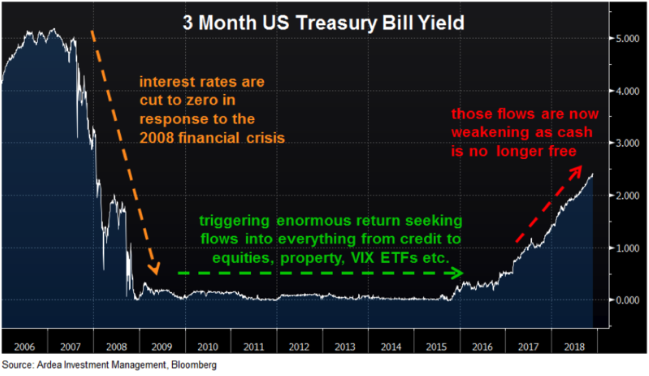 A wall of money progressively moved up the risk spectrum, into riskier and riskier assets, in order to generate higher returns … the so called ‘reach for yield’. In fixed income this manifested as capital rotating out of cash deposits and government bonds into progressively riskier credit securities. More broadly, capital poured into everything from equities to emerging markets, property, VIX ETFs etc. … basically anything that offered a return above zero. This was a paradigm in which the desperate search for returns trumped considerations of how much risk was being taken to earn those returns. As risk free rates are now rising, the paradigm has changed. Cash is no longer free and those return seeking flows have correspondingly weakened. In July this year, the yield on 3 month US T Bills broke above 2%, and have since gone even higher. As the chart shows, this is a big change from the free money world investors had become accustomed to in the post financial crisis era, with more than half of that move higher happening in just the past 10 months. It’s not a coincidence that equities and pretty much all other asset classes have struggled over this period. Firstly, the discount rate applied to all financial asset valuations is now rising and therefore, all else equal, asset prices should become more vulnerable. Secondly, you can now earn 2.4% from risk free 3 month T Bills at a time when riskier assets are offering much smaller return pick-ups than they used to. This naturally means the compulsion to keep stretching risk budgets in the search for higher returns is no longer as strong and the risk vs. reward proposition of continuing to reach for yield is now much less appealing. This doesn’t mean all capital flows suddenly reverse into lower risk assets. Rather, it’s subtle at first, like water leaving a bath tub when the plug is removed. Initially you hardly notice but then it becomes increasingly obvious the water is running out. We’re already seeing some evidence of this, for example in accelerating outflows from even ‘safe’ investment grade credit assets. This dynamic has negative implications for asset price valuations and volatility across all financial markets. So far 2018 has only given us a small taste of this … we expect much more going forward. "This doesn’t mean all capital flows suddenly reverse into lower risk assets. Rather, it’s subtle at first, like water leaving a bath tub when the plug is removed. Initially you hardly notice but then it becomes increasingly obvious the water is running out"
The information in this article has been prepared on the basis that the Client is a wholesale client within the meaning of the Corporations Act 2001 (Cth), is general in nature and is not intended to constitute advice or a securities recommendation. It should be regarded as general information only rather than advice. Because of that, the Client should, before acting on any such information, consider its appropriateness, having regard to the Client’s objectives, financial situation and needs. Any information provided or conclusions made in this article, whether express or implied, including the case studies, do not take into account the investment objectives, financial situation and particular needs of the Client. Past performance is not a guide to future performance. Neither Ardea Investment Management (“Ardea”) (ABN 50 132 902 722, AFSL 329 828), Fidante Partners Limited (“FPL”)(ABN 94 002 835 592, AFSL 234668) nor any other person guarantees the repayment of capital or any particular rate of return of the Client portfolio. Except to the extent prohibited by statute, neither Ardea nor FPL nor any of their directors, officers, employees or agents accepts any liability (whether in negligence or otherwise) for any errors or omissions contained in this article.